Dr. Dennis Slamon (left) and Dr. Richard Finn. In a groundbreaking study that offers new hope for women with advanced breast cancer, researchers from UCLA’s Jonsson Comprehensive Cancer Center have published final clinical trial results that showed the amount of time women with advanced breast cancer were on treatment without their cancer worsening was effectively doubled when they took the experimental drug palbociclib. An investigational drug discovered and being developed by Pfizer Inc., palbociclib targets a key family of proteins (CDK4/6) responsible for cell growth and prevents them from dividing. Results of the multi-year Phase 2 study showed a significant increase in progression-free survival —the length of time a patient is on treatment without tumor growth — for women with advanced breast cancer that was estrogen receptor-positive, HER2-negative, who were given a combination of the standard anti-estrogen treatment, letrozole, and palbociclib compared to letrozole alone. “We’re essentially putting the brakes on cell proliferation and causing these tumor cells to stop growing,” said Dr. Richard Finn, associate professor of medicine at UCLA and lead author of the study. The study was published online Dec. 15 ahead of print in the journal The Lancet Oncology. 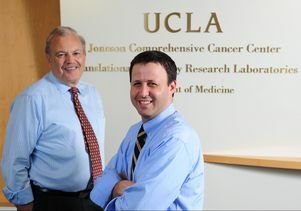 The origin of the research dates to 2007, when Finn and cancer pioneer Dr. Dennis Slamon, UCLA professor of medicine and director of the Revlon/UCLA Women’s Cancer Research Program, held a meeting with Pfizer to discuss palbociclib and other experimental drugs in the company’s pipeline. Preclinical work testing the drug in a panel of human breast cancer cells growing in culture dishes showed very encouraging activity, specifically against estrogen receptor-positive cancer cells. This led to clinical study collaboration with Pfizer led by Finn and built on laboratory work directed by Slamon at the Translational Oncology Research Laboratory at UCLA. Once the Phase 1 study was completed and showed that the drug was safe, the Phase 2 study was performed in 165 post-menopausal women with breast cancer who had advanced estrogen receptor-positive, HER2-negative disease. Phase 2 results showed progression-free survival was 20.2 months for patients who received palbociclib plus letrozole and 10.2 months for those who received letrozole only. The results indicated a 51 percent reduction in the risk of disease progression with the addition of palbociclib to letrozole. Results found that more than 80 percent of the women with metastatic estrogen receptor-positive breast cancer in the study received some benefit from this treatment, Finn and Slamon said. The drug doesn’t have the side effects, such as infections, of traditional chemotherapy, but does result in a lowered white blood cell count, which was very manageable. A Phase 3 international clinical trial of the drug conducted by Finn and Slamon with Pfizer in 660 women with estrogen receptor-positive, HER2-negative advanced breast cancer is ongoing. Because so many of the women in the early testing showed significant long-lasting responses, the FDA granted palbociclib “breakthrough therapy” status in late 2013. Gloria Zollar, 78, mother of five, joined the Phase 2 clinical trial in August 2010, after her UCLA oncologist discovered that her advanced breast cancer had spread to her bones. Only one year later, doctors noticed that her tumors had stopped progressing, which allowed Zollar to remain active and continue playing golf. 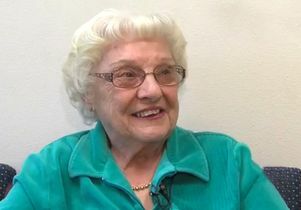 “I am now in remission, and everyday I’m thankful to God that I’m alive and able to see my great-grandchildren and spend time with them,” said Zollar, who remains on the treatment. With FDA having granted palbociclib “breakthrough therapy” status in late 2013, Zollar hopes the drug is made available to other patients battling this deadly disease.